I am not an Apple fanboy, but I have defended the company's decisions and philosophy more times than I can remember. And for good reason. But, looking at the new MacBook Pro line, I am finding it hard to see where that "touch of genius" is. What exactly makes its latest laptops anything more than glorified MacBooks? Apple has never been afraid to take risks and innovate. 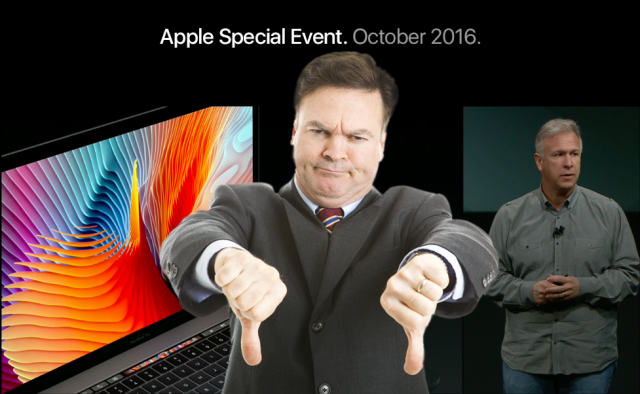 But with the new MacBook Pros it has failed to improve upon their "Pro" status. It wrongfully applied the same approach it has used over and over again in the consumer space without considering that prosumers, the folks who MacBook Pros used to be designed for, have a different set of needs than the average Joe who buys a MacBook Air to go on Facebook at Starbucks. As a result, the new MacBook Pros, while different than before, are not evolved enough for this day and age. The so-called "touch of genius" tagline is proof that Apple has lost touch with the real world. Now, before going any further I will admit that Apple will probably sell a ton of the new MacBook Pros. It usually does, and there is no reason to suggest sales will drop, taking into account the fact that the last major update to the Retina display-toting MacBook Pros came aeons ago. People who are looking to replace their aging rMBPs will look at what Apple has to offer first and will probably decide to move to a new model. In the short run, that will work out fine, but in the long run Apple risks having to do the same thing it did with the iPad line, which is to Pro-ify it. Remember, we are talking about PCs here, regardless of the fact that they run macOS and have an Apple logo on the back. And PCs aren't selling all that well these days, because, among other things, people do not have good-enough reasons to pull the trigger on a new one, because, well, the improvements are not all that compelling. But, let's get back on to the topic at hand. Looking at the new MacBook Pro line, it feels like Apple wants to unify its MacBook range a bit too much. The MacBook shipped with a USB Type-C port, and so does the new MacBook Pros. Except they don't have only one, they have four. Except if you get the base new MacBook Pro in 13-inch trim, which only has two. And of the two, only one is usable if you are charging it. But the trouble is that, in order to use any of them, you either have to buy devices with USB Type-C ports or get dongles. The USB Type-C device market is basically irrelevant at this stage in the grand scheme of things. Even Apple believes so, because it did not bother to introduce a compatible iPhone charger. You can get a USB Type-C to Lightning cable to transfer files, but you can't use it with the charger -- so you also have to carry the standard cable around. Or you can get, you guessed it, a dongle. To be frank, that's stupid. I may be harsh, but Apple prides itself on its attention to detail. So how could it have missed that if you buy one of its new products you will not be able to use it seamlessly with another one -- that is also new, and arguably more important? Remember, the iPhone 7 launched last month, not five years ago. It's not a legacy product. I am sure that lots of iPhone users would have been fine with buying a new cable and charger with USB Type-C connectors. This would be a more elegant solution, rather than having to carry a dongle to charge your iPhone and transfer some files quickly -- or a second cable. Apple also seems to be torn between two technologies. On the latest MacBook Pros you get USB Type-C, with Thunderbolt 3 support, while on the iPhone 7 you have Lightning. The iPhone carries more weight, and so you can't change from Lightning to USB Type-C as easily as you can switch from standard USB connectors to the new reversible one -- because it would affect far more customers at once and relatively soon after ditching the old connector -- but I am sure that Apple is probably thinking of it. But that is not the biggest problem. The USB Type-C adoption is, and it is time to address it. If you buy a new MacBook Pro today, for each USB device that you buy you will have to get a $19 dongle to be able to use it with your new laptop. And you will have to carry as many as you need with you, otherwise you will not be able to stick something as basic as a USB drive in your cutting-edge device. Connectivity-wise, without dongles, the new MacBook Pros are crippled. Apple likes to take risks, and someone will surely point out that things will change and that USB Type-C is better and that the company is simply ahead of the curve. And that may very well be true, but fact of the matter is no one is fully prepared for the new MacBook Pros, not even companies making products that should work with it. Something else that I find to dumb down the new MacBook Pro line is the fact that there is no MagSafe connector anymore. And that is not a change forward, because MagSafe is cleverly designed to protect your laptop from being damaged if you trip on the charger's cable. The USB Type-C cable that's provided to charge the new laptops doesn't have a similar functionality. So that is a clear step backwards. Luckily, you still have the 3.5mm headphone jack, which is good because I would have hated to talk about yet another dongle. Unfortunately, I can't -- because you will need one to connect an SD card. Yes, Apple dropped the SD card reader, even though it is basically as slim as a USB Type-C connector, and, arguably, incredibly useful to the vast majority of photographers. Most professional-grade cameras use SD cards, and now you will have to (I hate to say it one more time, but here goes) get a dongle to transfer photos and videos to a new MacBook Pro. Two cool new things that you do get -- again, unless you opt for the base model, which only gets the latter -- are the Touch Bar and larger trackpad. The former is the real party trick, but I suspect that the bigger surface area of the trackpad will be more appreciated, more of the time. I have not used a Touch Bar, so I cannot really share my experience with it, but from everything Apple has said it does not look like a revolutionary addition. What's more, it is unlikely to be extremely useful soon, because Mac developers typically need a bit of time before they embrace such features. And, really, I do not use as many apps where it could be extremely useful. However, the TouchID support is a fantastic addition. However, I do not live in an environment where the risk of someone else using or stealing my laptop is worth thinking about. And Apple Pay is not in the equation either. So, let's just say I'm skeptical of the benefits it provides in return for the premium it involves. But the elephant in the room is not what Apple has removed. It is what Apple has not added. And that is anything that can move the game forward in terms of laptop technology. Everything that you see on the new MacBooks has be done before -- in some form or another, if not better -- and it is not like Apple just had an iPhone moment where it managed to combine all those things in a way others have not. With the exception of the Touch Bar, most of what you see on the new MacBook Pros represents an evolutionary move from the previous generation: a bit smaller, a bit lighter, a bit thinner, a bit faster, a bit more color variety, and that's pretty much it. For the kind of money that Apple is asking for a new MacBook Pro, I honestly expect more. And I do not expect more for the sake of it. No. I expect more because Microsoft is doing more. Have you seen the recent Surface announcements? Barring the Surface Pro 4, which hasn't received an update yet, the software giant's PC line looks incredibly innovative and refreshing next to Apple's. And Microsoft is not even trying to compete on price, because some of its stuff is hugely expensive. No, Microsoft is competing with Apple by doing what Apple should have done, which is to change the status quo. The new MacBook Pros are not all that different to the old ones or other laptops for that matter, but the Surface Pro 4, Surface Book and Surface Studio are. Microsoft is the bolder of the two, and it shows. Apple looks complacent by comparison.